Tom and Jash visited Artizan Interiors when they were planning a refurbishment and extension of their home in Weybridge. Alex and Fred put forward several design proposals for different building plans so that they could visualise a layout and choose the right size extension to accommodate their plans and vision. Externally, the house is a mock Georgian detached property and internally Tom and Jash wanted a modern and clean look, but not too minimalistic as they have two young children and they felt that from a practical point of view, it would be difficult to maintain the look if it were too understated. Alex designed a kitchen that was very modern but used a combination of real wood doors and white gloss with white corian worktops. 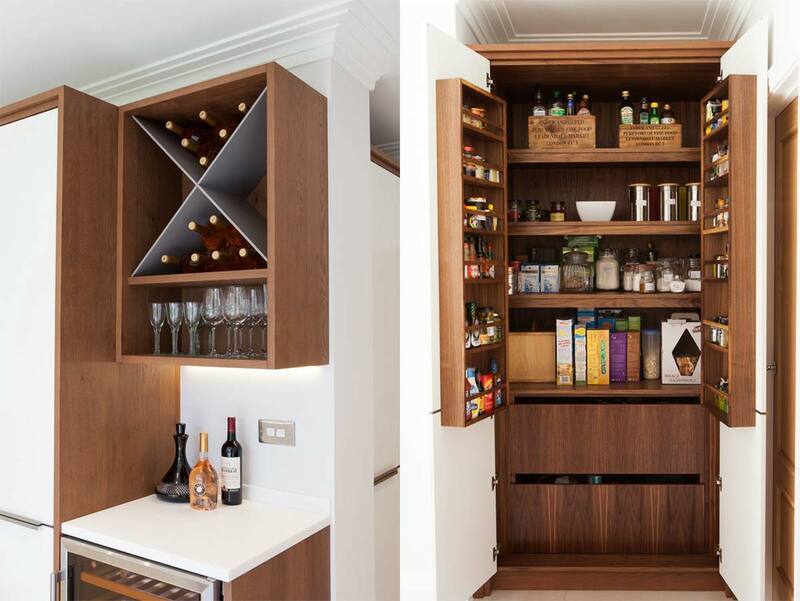 The wood softened the design and they added some bespoke elements like an open wine storage unit and walnut pantry to make the kitchen more personalised. To compliment the kitchen area, Alex also made a media unit for the tv snug and some simple office furniture and shelving in the study as the clients often work from home. 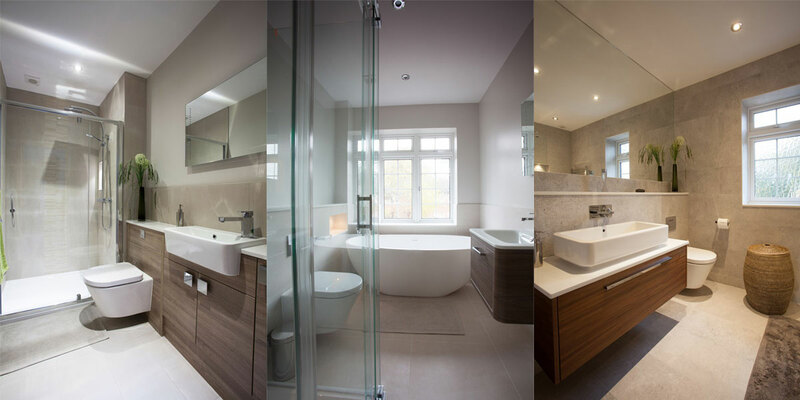 In addition and as part of the refurbishment, there were 3 bathrooms and a cloakroom to be designed and installed and these needed to be bright and fresh with a modern feel. The cabinetry used delivered on their brief and added an element of elegance to the rooms. 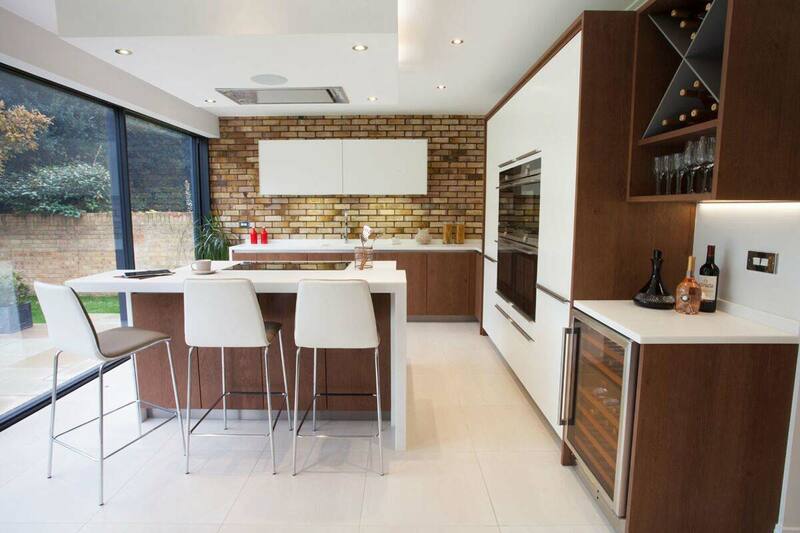 “We have used Artizan Interiors for a number of projects around our home ranging from refurbishing and remodelling the kitchen to the design and installation of innovative storage solutions in our living areas. We have been absolutely thrilled with the results and couldn't recommend Alex and the team more highly. The entire process was professionally managed from design, quotation through to the high-end finish. The team was hugely creative and had a high attention to detail and not only realised our ideas and plans but totally exceeded our high expectations. We could trust Alex with making excellent decisions around the design and fittings making the whole process easy and fast whilst being considerate of our budgets. Working with Alex and the team was a joy and we will most certainly be using them again for future projects - big or small. Thanks for making our home a special place"